Contents: 40 pages, photographs, colour plates. Disadvantages: Limited paint matches and no FS cross-reference; top-view Hurricane camouflage scheme (page 7) is slightly off; limited availability. 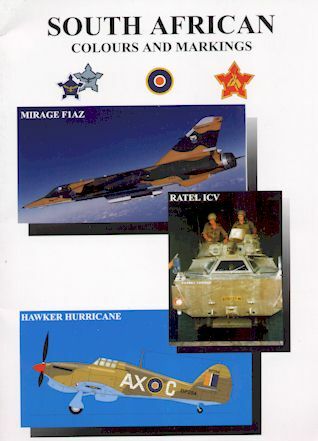 The first volume of "South African Colours and Markings" covers the Hawker Hurricane, Mirage F1AZ and the Ratel ICV in South African service. Each volume will be limited to a print run of 700 copies. The book is printed in full colour on high quality glossy paper. Its 40 pages (including covers) are in A4 format and centre-bound by staples. The focus of the book is the colour artwork. Each subject is lavishly illustrated with between 20 and 30 colour drawings each. The drawings have a colour key with a description of the colours, and in some cases BSC cross-references. The Ratel artwork is supported by a Humbrol paint reference. It would be nice to see a cross-reference for acrylic paint too; and also to see the paint references applied to the aircraft colour key. There are some great schemes for the Hurricane amongst the 29 presented, including post-war markings with wide yellow wing bands; desert birds in wartime service; and early, two-bladed Hurricane Is with yellow codes. However, the upper-surface camouflage demarcation lines in the drawing of the Hurricane "A" type camouflage scheme on page 7 is slightly incorrect. Check kit instructions for a more precise pattern. Colour schemes for the South African Mirage F1AZ vary between colourful buff and green camouflage, to air-superiority grey (in an interesting geometric scheme) and even a brightly coloured avionics demonstrator. The text for the Hurricane and the Mirage I is sparse but helpful. A little more textual detail is supplied for the unusual Ratel Infantry Combat Vehicle. Text and artwork is supported by many reference photos. The Ratel section deals with many variants including anti-tank gun, standard carrier, mortar carrier and Command versions. Unit shields, badges and other markings are well covered in this section. Layout of the book is very clear and attractive, with watermark images and borders adding to the appeal of the content. Volume Two is due out in August 2000, and covers the P-40, Vampire and SA Reconnaissance in South African service. There are plenty of modelling choices for the Hurricane and F1. This book will provide lots of ideas for unique colours and markings. South African Colours and Markings is available by contacting the Authors by email.